Peter Hedges (1962)...Novel "What's Eating Gilbert Grape?" 1993 was a banner year for filmmaking. One could say that Hollywood and film companies around the world were vying for the prestige associated with making intelligent, well written film projects. In a year that saw the releases of stellar films such as The Piano, Schindler’s List, In the Name of the Father, Shadowlands and The Remains of the Day, one great film with the year’s greatest acting performance, would be sort of lost in the shuffle of these remarkable movies. Directed by Lasse Hallström, What’s Eating Gilbert Grape would find its own audience with the art house crowd that thrived upon films rich in substance. Set in the heartland, its spins a tale of a disillusioned young man coping with the unwanted responsibilities thrust upon him by his family. Starring Johnny Depp as the title character, Gilbert Grape, the film truly belongs to an up and coming young actor who, unfortunately, would make his biggest splash (no pun intended) a few years later in the mega-film Titanic. In 1993, Leonardo DiCaprio was an unknown nineteen year old actor with just two films under his belt. With his turn as Arnie, the autistic younger brother of Gilbert, DiCaprio would receive his first Academy Award nomination for his exemplary performance in this film. Every moment his character is onscreen, you can’t help but keep your attention focused on him. The small ticks, twitches and vocal murmurings of a person born with this mental deficiency, seem to come as second nature to DiCaprio. In the end, his loss to Tommy Lee Jones (The Fugitive) in the Best Supporting Actor category is one the greatest examples of how the voting of Academy members is so removed from reality some years. 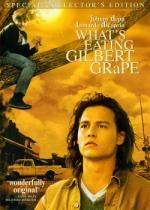 Gilbert Grape is a young twenty-something living in the sleepy, dreary and dusty mid-western town of Endora. He lives day-to-day with the burden of being the eldest son of a woman whose obesity has made her somewhat of a curiosity and the laughingstock of the town. Heaped upon his shoulders is the responsibility of caring for his mentally challenged brother, who tends to insert himself into what could become dangerous situations, thus assuring the intervention of police and fire personnel who are fed up with his antics. With the patriarch of the family long since departed after abandoning his family, Gilbert has assumed the man of the house responsibilities and by his mid-twenties has had enough. He sees his life drifting aimlessly through time and when he meets a young girl who is stranded in town waiting for her grandmother’s car to be repaired, he gets his first taste of true romance. Knowing that his new love will soon move on after the car is fixed; he faces the quandary that fate has now placed him in. Whether to stay and face a life of tedium and slow descent into manic depression or to forgo his family and steal away with his new love for parts unknown and the hope of happiness. From beginning to end, What’s Eating Gilbert Grape is an interesting window into the world of a young man’s disenchantment with his surroundings. Never for a moment does it descend into a preachy pathos that would make it unbearable to watch. The performances by the entire cast are first rate, with of course, the special nod to DiCaprio. I can highly recommend this film to anyone who unabashedly appreciates stories that are entertaining as well as thought provoking. Give it a chance, if only to witness DiCaprio’s amazing performance.